Can Companies Collaborate With Cities On Sustainability? Recently, Agrion offered me the opportunity to present a webinar on Company involvement in sustainable cities. The seminar was moderated by Agrion’s Josh Soble and included input from Andrew Watterson, a Brown Flynn senior consultant who previously served as the Chief of Sustainability for the City of Cleveland and Julie Marth, who runs the Office for a Healthy Environment at the world-famous Cleveland Clinic. In my role as CSRHub’s CEO, I mostly work with corporate sustainability professionals and their advisors. 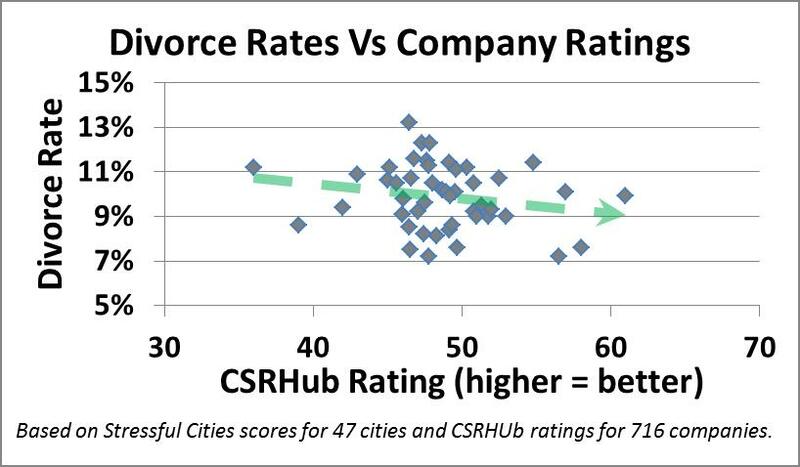 We provide data on corporate social responsibility and sustainability performance, and involvement with the community (e.g., the cities that companies live in) is only one of the four major categories we rate. However, I wondered if our huge database of company information could be combined with measures of city sustainability to at least show a connection between the two. 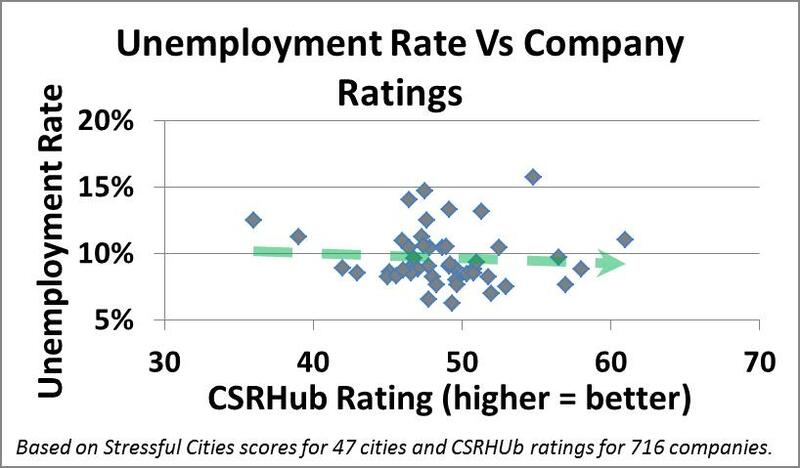 Our research described below found that there does seem to be a connection that suggests that by working together, cities and companies may end up with happier and healthier citizens and employees. I started my part of the talk by pointing out that most large companies have sustainability programs. A good way to prove this is to use our proprietary tracking of company CSR website areas. 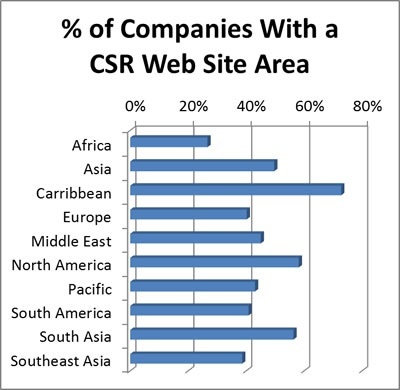 More than 3,000 of the 5,000 companies we rate (across 65 countries and 135 industries) have a CSR area on their site. About 58% of US companies share sustainability information in this way. We base our ratings on data from more than 170 sources of sustainability information. Many of these sources get data from local communities—so there is good input from this “stakeholder” group. 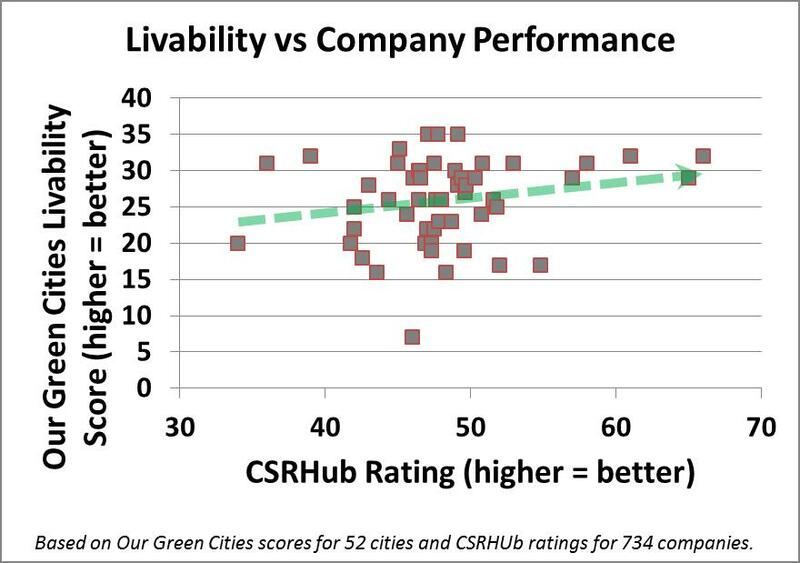 When we compare our sustainability ratings for US companies against a measure of company sustainability like the “Our Green Cities Livability Score,” we find a reasonably good connection. Our usual “chicken and egg” caveat applies to this work. It is possible that more sustainable companies are attracted to and locate in more sustainable cities, or it could be that sustainable cities encourage their local companies to improve their social performance and contribute to the cities they live in. Either way, there does seem to be a connection that suggests that by working together, cities and companies may end up with happier and healthier citizens and employees.